Popular123.com is the PUP that uses misleading techniques to prevent removal. Use Reimage to locate malicious components and get rid of them faster than with uninstall instructions. A full system scan blocks virus reappearance and prevents traffic to malicious domains. 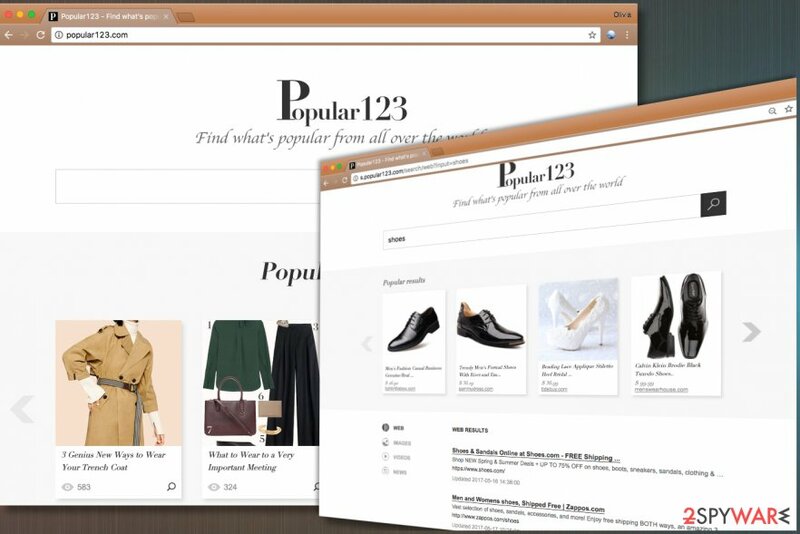 Popular123.com virus is a browser hijacker that typically configures homepage and new tab page settings in the most popular web browsers such as Chrome or Firefox. It tends to sneak into the system in a bundle with freeware, add suspicious extensions to browsers and then starts causing redirects to hxxp://Popular123.com/ site, which looks like a typical web search engine. It suggests finding “what’s popular from all over the world,” although it mostly advertises all kinds of products from numerous e-shopping sites. Even if you enter a phrase into the search engine and hit enter, you still receive ads first, which is kind of annoying. It can become a real issue when you are trying to look for relevant information online, for instance, for your studies or work. Naturally, users start looking for Popular123.com removal guidelines when seeking to eliminate this hijacker. We have provided a comprehensive tutorial for those who are determined to uninstall the virtual parasite manually, but we highly suggest completing the removal using anti-malware software like Reimage. Ads, however, is not the only concern that bothers us. What is even worse is that the described program can start causing redirects to untrustworthy third-party websites all of sudden. Be very careful if the bogus search engine redirects you to an unfamiliar Internet site. Remember that hazardous sites often ask you to provide personal information or install certain programs, so if you come across such pages, quit them immediately. Remember that collected information can be easily misused; besides, you can never know how safely it is stored and whether it can be affected by data breach. Therefore, we suggest thinking about Popular123.com removal options we have mentioned earlier. If your browser's homepage was changed to Popular123.com, do not attempt to search the Internet using the search engine provided by it. Otherwise, it might introduce you to dangerous websites that can pose a threat to your computer system and your privacy! Browser hijackers are no different from other potentially unwanted programs such as adware. To avoid installing them, one needs to be careful when browsing the Internet, and even more cautious when installing new software on the system. Potentially unwanted software rarely spreads on its own and mostly travels in a bundle with popular free software such as games, media players or download managers. To prevent installation of unwanted software, we suggest choosing Custom or Advanced mode in the setup. After choosing one or another option, deselect suggested extra programs. Usually, that is all that it takes to prevent browser hijacking. Remember that Default and Standard settings often hide statements about additional downloads so do not think that absence of information about bundled programs means that no extra programs will be installed. Do not worry anymore and remove Popular123.com virus using tutorial provided right below the article. You will need to eliminate components of the hijacker placed in several computer locations. If you are not ready to start exploring your PC system that deeply, you can just employ anti-malware software for a quick Popular123.com removal. Study the guide provided below and eliminate every program that was installed without your knowledge. If you have doubts about certain programs, look for information about them online. Remember that dangerous programs can try to conceal themselves by using names of legitimate programs! Here, look for Popular123.com or any other recently installed suspicious programs. Wait until you see Applications folder and look for Popular123.com or any other suspicious programs on it. Now right click on every of such entries and select Move to Trash. When in the new window, check Delete personal settings and select Reset again to complete Popular123.com removal. Once these steps are finished, Popular123.com should be removed from your Microsoft Edge browser. Here, select Popular123.com and other questionable plugins. Click Remove to delete these entries. Now you will see Reset Firefox to its default state message with Reset Firefox button. Click this button for several times and complete Popular123.com removal. 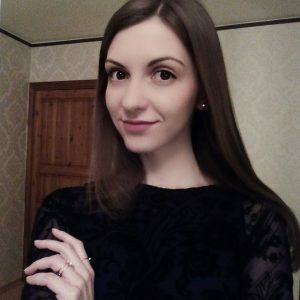 Delete extensions that did not originally come with Chrome browser. Do not hesitate and delete every suspicious extension that you cannot remember installing. Here, select Popular123.com and other malicious plugins and select trash icon to delete these entries. Click Reset to confirm this action and complete Popular123.com removal. Here, select Extensions and look for Popular123.com or other suspicious entries. Click on the Uninstall button to get rid each of them. Here, look at the Homepage field. If it was altered by Popular123.com, remove unwanted link and enter the one that you want to use for your searches. Remember to include the "http://" before typing in the address of the page. Now you will see a detailed dialog window filled with reset options. All of those options are usually checked, but you can specify which of them you want to reset. 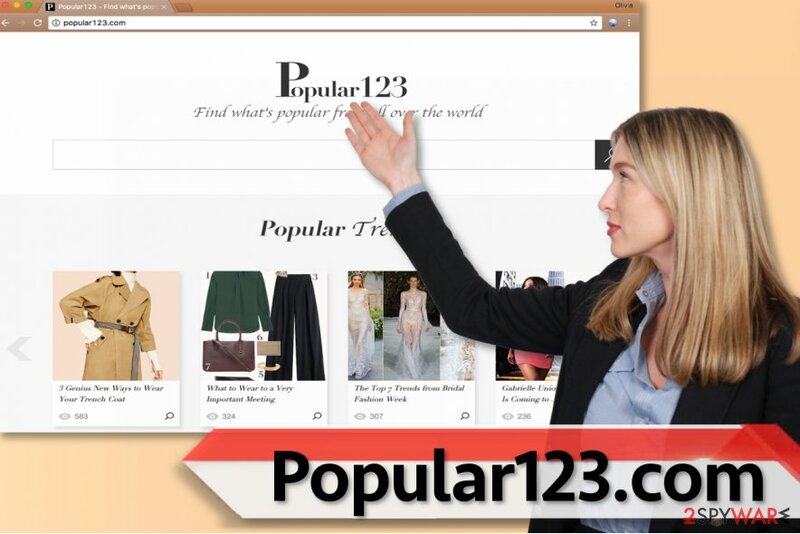 Click the Reset button to complete Popular123.com removal process. ^ Chris Hoffman. Why Browser Extensions Can Be Dangerous and How to Protect Yourself. How-To Geek. For Geeks, By Geeks. ^ Jacob Olcott. Deconstructing the 2016 Yahoo Security Breach. Dark Reading. Cyber Security's Comprehensive News Site. This entry was posted on 2017-08-23 at 02:02 and is filed under Stealing programs, Viruses. You can quickly scan the QR code with your mobile device and have Popular123.com virus manual removal instructions right in your pocket. How did you remove Popular123.com virus?